I randomly stumbled upon this product I designed over a year ago. I had no idea it went into production or what happened to it. But it was a awesome surprise to see it in stores. The full project including research, store visits, ideation, CAD work, and countless meetings with Trojans marketing team took about 2-3 months. Once I handed it off, I haven’t heard any updates with the project, so I assumed it died within the Trojan pipelines, as many new products do, but I guess they were working on the supply chain and other logistics. I have been in the market for a new camera strap for the past couple weeks. Everything I found was too boring, I wanted something a little more loud. 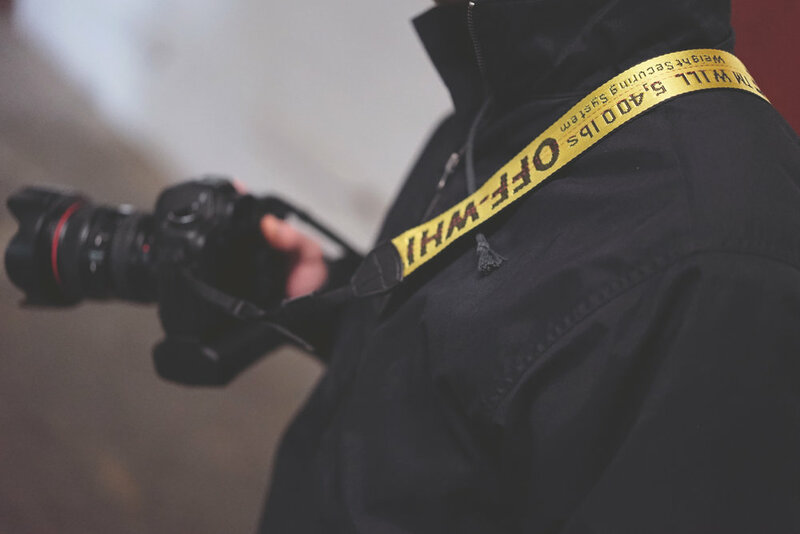 I quickly came to realize that there were no Designer/Streetwear Camera straps. 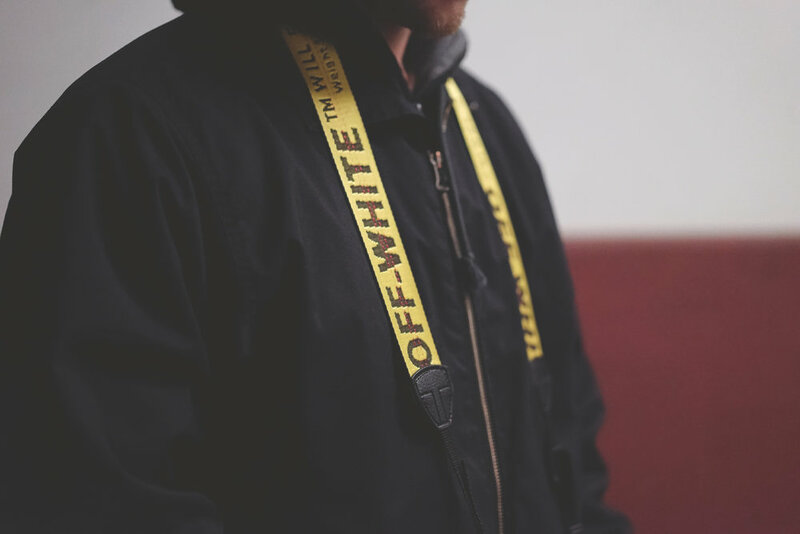 So I purchased the OFF-WHITE c/o VIRGIL ABLOH™ Industrial belt in yellow, cut it up and made my own. last week my current cable box randomly stopped working and Xfinity #blessed me with the new cablebox and the voice controlled remote. The new design and all new features of the XR5 remote were greatly improved from the last Xfinity remote I had, and right when I held it for the first time instantly became fascinated by it. Everything from the parting lines to the Finish intrigued me. I was curious to see what the next generation of the XR5 would look like. So I set off with that in mind and began the design process. I wanted to encompass multiple services that Xfinity Offers, TV and Phone in the design. I recently read an article on hypebeast about how 'bootlegs are intrinsic to the evolution of fashion'. The article showcased how both high-end brands and streetwear brands both are being copied and copy other existing designs for their own. This got me thinking how I can parody the ever so famous bape ape logo and relate it to pop culture, Harambe's unfortunate death, so I created this HARAMBape design. Without a doubt, the YEEZY BOOST 350 was one of the most coveted sneakers to release in 2015 and in my opinion it is also one of the best designed silhouettes that year. I was one of the lucky few to be able to get a pair. After having them in my possession for a few months, I decided to use them as inspiration to design a pair socks calling out all the most notable design features. if i get enough interest in these socks, I will produce a limited run of them. I have owned a couple other generation of the ipad with that I also bought a few different styluses with the intention of using them to sketch with. I have never really liked the sketching experience, Until Now. I find the apple pencil to be really responsive, and the palm recognition works really well. I almost prefer using the ipad Pro to the Wacom Cintiq. Overall Design of the Pencil is pretty nice; it feels good in the hand and has a good weight to it, however there are some flaws. I will start out with the obvious flaws, charging the pencil. The Pencil charges in the bottom of the ipad via Lightning port and every time I plug it in I am either scared the port will snap off and break or I will loose the end cap. I am always extra cautious while charging. Another issue is that I found the pencil to be a bit slippery. Although the Gloss finish looks cool, a slight texture might make it less slippery. Since the Pencil is a perfect cylinder I find that it rolls off my desk or workspace quite often. Adding a minor Flat edge or something to help it from rolling would be helpful for me. On a whim I decided that I wanted to design and produce self branded pins. So I sought out a proper manufacturer and sent them a SPEC sheet with the final artwork. After a few back and forth emails and samples, i got the final products. I am very happy with how they turned out. I have been wanting a pair of Visvim Shamans for a while now, however the high price tag and even higher resale is what kept stopping me from getting a pair. Over the past couple weeks I came across a few people making customs “inspired” by the Visvim sneaker using Nike soles and Minnetonka uppers. I thought I would give it a shot. I have never done anything like this before, so I basically had to learn as I went on. The whole project took me about 6 hours of work over a 2 weeks period. I am really happy with the outcome, and Cant wait to see what’s next. Whenever I come across a silhouette I admire, I instantly become inspired. I start to re-imagine the shoe in different ways and color concepts inspired by the things around me and all of my experiences. Since I am a fan of this Silhouette by Nike, I set out to create color way of the shoe inspired by "Streetwear in fall"
While on my normal commute, I stumbled upon an Exotic woodstore, after talking to the owners and getting a small 5x5x0.5 sample of some rare wood - I forgot what kind, I decided to turn the sample into a straight razor for my cousin, since he is a barber. I made the straight razor out of a single piece of wood that I cut out a groove for the blade, I did not want to sandwich two pieces together because I felt that would ruin the unibody look. I did most of the work with the band saw, sander, and dremel. I finished the piece with polyurethane. I wanted to do something special as a graduation gift for my girlfriend. After giving it some thought I decided to design her a ring. After discretely measuring her finger, I took the Logo that she made for herself and put it into Rhino. After making minor tweaks I had the finished file done. I tried to do test prints with the Makerbot, however the size of the ring and the small details failed every time. Eventually I sent the rings off to be printed with the precious metal options from Shapeways, I couple weeks later I received them in the mail, and they looked better than I could have imagined. I tried to take process photos along the way, however there are a few steps i missed.